If you've lived in a big city, you can relate to this story. 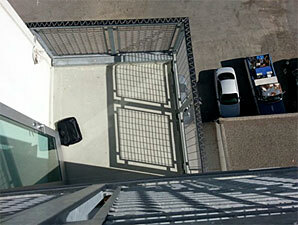 One of the big selling features for the tenants of a high-rise apartment complex was the balcony. Unfortunately, it was also a big selling feature for pigeons who used their hand rails as a long-term roosting place. The rails, the spindles, and the balconies themselves were all covered in a smelly, unhygienic mess. That is, until the building manager brought in Hot Foot and our exclusive Repellent Gel. 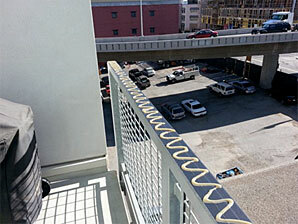 Each balcony was cleaned and sanitized, which in itself lessened the attraction for the pigeons. Then, our Hot Foot Repellent Gel was applied to the tops of the rails making the pigeons' roosting spot very sticky and uncomfortable. Within hours of application, they got the message - the pigeons flew off unharmed to find another, more hospitable roosting place. This low-cost, easy-to-install solution made a huge difference in the lives of the tenants - and helped ensure the building owners still got top dollar for their balcony apartments.